Luxembourg’s capital ranked second overall in Zipjet’s 2017 global ranking for the least and most stressful cities. The survey compiled data on 150 cities across the world and placed Luxembourg City behind Stuttgart, the capital and largest city of the German state of Baden-Württemberg, in the ‘least stressful’ ranking. 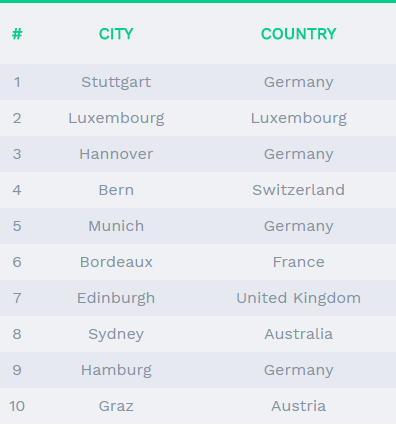 In the survey, the Luxembourg capital ranks well before many global hubs such as Munich and Frankfurt, in Germany; Bern and Zurich in Switzerland; Sydney and Melbourne in Australia; Copenhagen, in Denmark; Seattle in the US; or Montreal and Vancouver in Canada, among others. For the survey, Zipjet, a London-based cleaning company, collected information on a number of criteria, such as population density, residents’ perception of security, availability of green spaces, air, noise and light pollution, a family’s purchasing power, physical and mental health, amount of sunshine, traffic and congestion levels, gender equality and transport network.